Cashing out your 401(k)? You might as well just take 1/3 of the money and throw it in the trash. Leaving your job? Whatever you do, don’t cash out your 401(k) and spend the money. Unfortunately, that is a very common mistake made by younger workers. According to a study by Fidelity Investments, 41 percent of plan participants ages 20 to 39 cashed out a 401(k) when leaving their job last year, the highest of any age group. Why is cashing out your 401(k) such a bad idea? Tax, more taxes, and even more taxes. The only one who profits when you cash out your 401(k) is the IRS. The money you take out of your 401(k) when you leave a job has not yet been taxed. That means it’s all taxed as ordinary income at your highest tax bracket the minute you cash it out. That knocks 20% of the total right off the top and sends it to Uncle Sam. But we’re not done yet. If that’s not enough, you’ll also get hit with a 10% early withdrawal penalty if you’re under age 59 1/2 (or 55 in some special cases). So if you’ve managed to sock away $15,000 in your 401(k) and cash it out when you leave, you’ll be left with only $10,500 by the time you reach the exit door. Weren’t you saving it for a reason? You desperately need the money in that 401(k) to support you when you retire. So if you take it out and spend it when you’re 28, it won’t be there when you’re ready to pack it all in. The money you start saving in your 20s and 30s is the best money of all. It has decades to compound and grow. The sooner you start to save and invest, the less you need to save. It all adds up to …. nothing. Younger workers don’t plan to spend their entire careers with one employer, and tend to change jobs fairly frequently. If they’re not careful, they can hop from job to job and end up with nothing to show for it. “The problem is that cashing out these small 401(k) plan account balances can have a significant impact on future retirement savings. Workers are likely to change jobs five to seven times before they settle into a long-term job. If they cash out every two years, they could find themselves with nothing saved for retirement well into their 30’s,” writes Ray Martin for CBS News. Starting later makes it that much harder to catch up. OK. I get it. So what should I do? There are several better options available to you. You can leave the money with your current employer, move it to your new employer, or roll it to an IRA under your control, which is almost always our preferred option. When done properly, a rollover avoids any current taxation, keeps your retirement funds working hard for you, and gives you full control over the funds, your investment choices, and your beneficiaries. When we talk to people nearing retirement age, their #1 regret is not starting to save earlier. Having money set aside helps them enjoy retirement, to be sure, but it also lets them take advantage of all the good things that make their lives special in the decades leading up to retirement. The Takeaway: Cashing out your 401(k) when you leave a job is one of the dumbest things you can do. So don’t do it. You worked hard to earn that money. 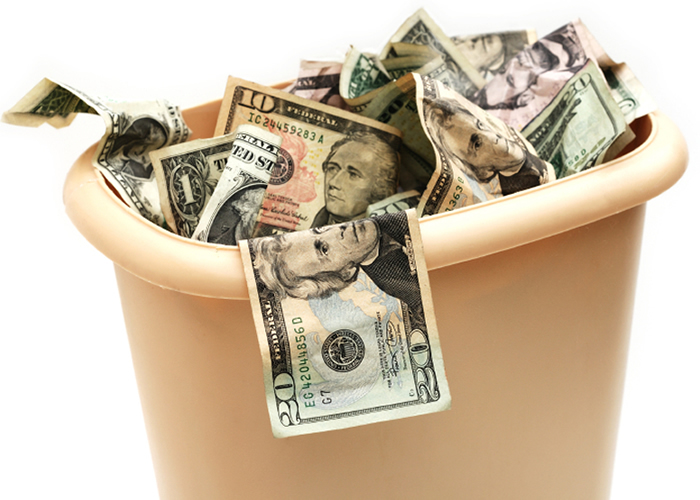 Don’t throw it away; roll it over into an IRA account and keep it growing for you.